Are you looking for an eCommerce WordPress Themes for building an online store? Then, this article will be really helpful for you to find awesome themes. These days many businesses are opening online stores as people love to have an online presence. In this condition, the eCommerce website is the best option as it is one of the main money-making methods for businesses that want to move their operations to the online. . The eCommerce site surely helps to take your business to the next level and create an online shop easily. Actually, to get an online customer it requires proper planning. You need to make your site attractive for this you need to choose the right theme. The eCommerce themes come with the features that are needed for creating an e-shop. They are highly customizable where you can make the settings exactly the way you want. Even a person with no coding knowledge can easily use the theme and create an eCommerce website and start selling the products online. And also, these themes come with ready-to-use designs for various types of shops like fashion and accessories store, furniture store, e-books and digital downloads store, Organic shop, electronics shop, etc. Flatsome is a responsive premium WordPress WooCommerce theme that can be used for various purposes. This theme consists of unlimited options and a revolutionary responsive page builder, so you can create anything without coding. It is the perfect theme for your shop or company website, or for all your client websites if you are an agency or freelancer. The theme has got all the tools needed to create super fast responsive websites with the amazing user experience. eCommerce Gem Plus is a feature-rich eCommerce WordPress theme, best suited for all kind of online shops. The theme features highly customizable homepage sections, easy to use a slider, the latest and featured pro, advertisement section, banners and more. With a few easy clicks, you can configure the theme as per your preference – without touching a single line of codes. It is integrated with the best WooCommerce plugin and includes advanced features and functionalities that are required to build a complete eCommerce website. Kids is a fuly responsive premium WordPress theme designed and developed with a baby store website in mind. This theme is perfect for any clothing store, toy shop, kids, family, creative, children’s or art themed website. It is very easy to set up and comes with a great set of features. The theme is compatible with the professional WooCommerce e-Commerce system which means it’s easy to start selling products in no time. Capri Pro is an awesome premium eCommerce WordPress theme perfect for crafting online shops. This theme consists of a neat and clean presentation which will help your sales and make your store accessible throughout the world. It is a fully responsive and well-optimized theme that looks beautiful on all the screen sizes. Also, the theme comes with live customizer which allows you to make awesome changes and visit it in real time project. Neto is a stunning eCommerce WordPress theme that includes many awesome features. This theme helps to transform your website into a beautiful e-commerce superstore perfectly. Moreover, it is fully integrated with some of the popular theme builders like Elementor, Divi, and SiteOrigin. You can easily translate the site into any language of your choice. It is compatible with all the major browsers that are well tested. Game Developer is an outstanding premium WordPress theme that is mainly designed for promoting recent games available in different stores. This theme has several sections on the homepage which can be used to explain the recent activities the blogger or the game developer is doing. It includes beautiful designs so, build a perfect looking website easily in no time. The Trip is a premium WooCommerce WordPress theme that is perfect to build a beautiful website easily. It is ideal for those who want to explain their journeys. It is ideal for both personal bloggers and tours organizing companies. Moreover, the templates come with a pre-maid layout and purpose pages. If there will be any difficulties while using the theme, then you will get awesome support from the team. Intrigue is a premium eCommerce WordPress theme that helps you to build an awesome looking website. This theme is highly responsive eCommerce theme that is suitable for any kind of products. It contains flexible layout options and multiple color schemes which empowers more features to this theme. The theme is compatible o all the major browsers that are well tested. StyleShop is a sleek and powerful eCommerce WordPress theme that provides all the tools you need to launch a successful online store. This theme includes a beautiful and responsive design that makes browsing your website on a breeze no matter what device you are using. And if you are looking for an all-in-one solution for your new business, then StyleShop is the theme for you. The theme uses best coding experiences to ensure that they are fast and secure. Flevr is a premium WooCommerce WordPress theme that comes with many amazing features. You can easily build your website’s homepage exactly the way you want it by using the custom content widgets where you don’t need any coding skills. It is compatible with the WooCommerce plugin that let’s you create a beautiful website perfectly. 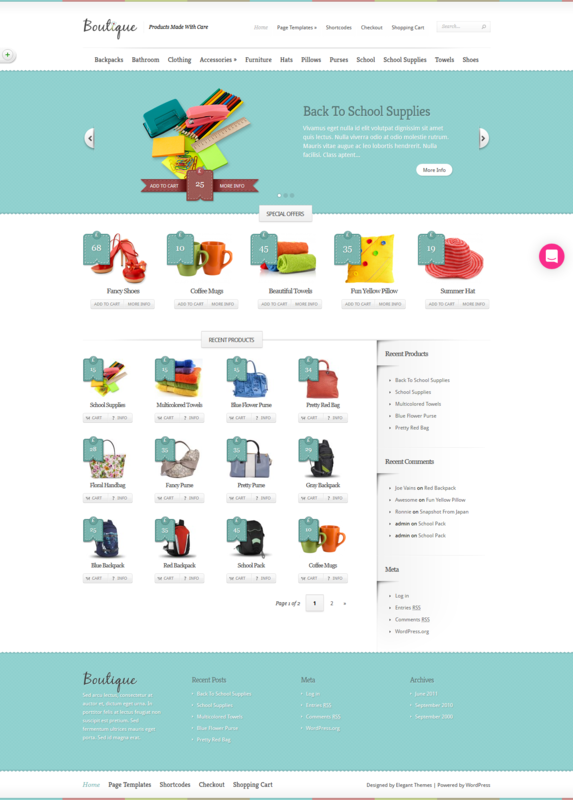 Boutique is a premium powerful eCommerce theme that gives you the power to open your own online storefront. Moreover, it is integrated with some of the brilliant WordPress eCommerce plugins found on the web. Besides them, this theme includes a color control panel which helps make the website more attractive. The theme includes our color control panel, allowing for an unlimited combination of custom colors, fonts, and backgrounds. Balance is a feature-rich premium eCommerce WordPress theme designed to wow shoppers. It includes a unique product grid and impactful white space call attention to your products. This theme is powerful enough for any size of inventory, as it can be tailored to suit any emerging or established brand. It is highly responsive which looks perfect in different types of screen ranging from huge desktop to small mobiles. Shoppe is a premium WooCommerce WordPress theme that helps you build professional eCommerce sites in minutes. This theme comes with the drag & drop Themify Builder and also includes many eCommerce features such as ajax cart, wishlist, quick look lightbox, ajax quick search, product image zoom/gallery, and tons of layout options. It contains additional theme skins that have the capability to transform your website into a new look. 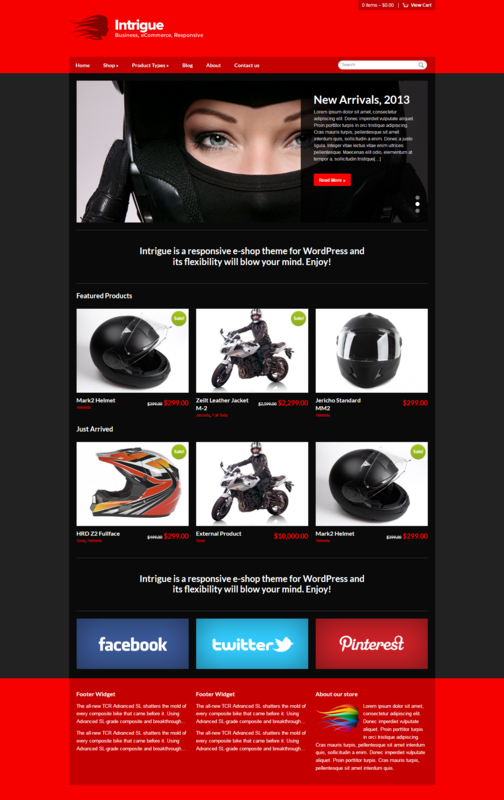 WP Store Pro is an advanced premium WordPress eCommerce/WooCommerce theme. This is a feature-rich online store theme comes with 4 different pre-designed web store templates. It is best suited for all types of online shops such as food and drinks, interiors, fashion, corporate, technology, accessories etc. The theme comprises lots of customization possibilities and multiple options where the coding skills are not required. Nitro is a stylish WooCommerce WordPress theme which you will need for any WooCommerce projects. The theme comes with ready to use layouts for different ecommerce industries such as fashion, electronics, furniture, digital, sports, jewelry and other. 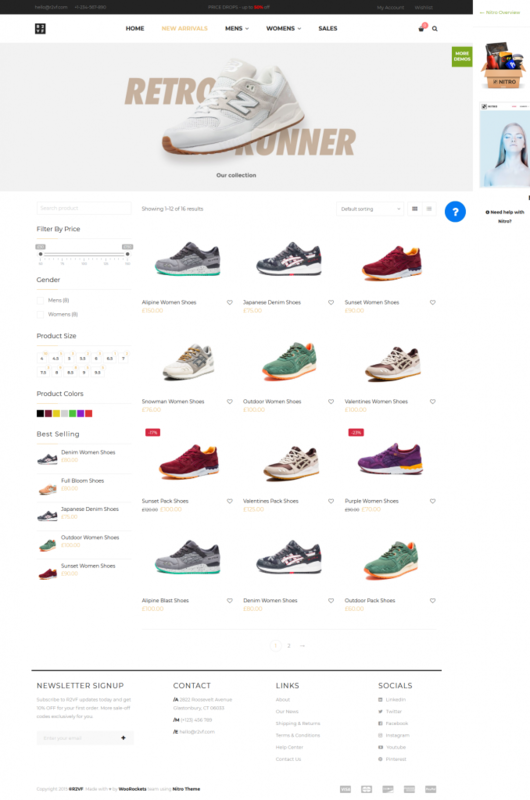 It represents what WooCommerce customers want to see in a theme including intuitive design (UX), robust performance (loading speed) and eCommerce functionalities (boosting sales). Dining Engine is an awesome premium eCommerce WordPress theme that is perfect for building any types of an eCommerce website. This theme comes with a fully responsive layout that looks beautiful on all the screen sizes from small to large devices. And, it is well optimized and compatible with all the major browsers that work perfectly well. Also, the theme includes WooCommerce plugin that let’s you design beautiful eCommerce website. BiShop is a fully responsive and easy-to-use WooCommerce WordPress theme. The theme provides three unique homepage layouts so, choose the one that you like. It is integrated with a Visual Composer Plugin worth $39. And the drag and drop page builder allows you to edit the content of the page without dirtying your hands with code. You can easily customize dozens of theme elements, hundred of stylish fonts and setup different theme settings. Shopkeeper is a stunning premium WordPress e-Commerce Theme for creating a successful online shop with no limitation. The theme was built for WooCommerce, the most popular eCommerce solution for WordPress, which helps you sell anything online, shippable goods, virtual or digital files. It allows you to create a perfect site for a wide range of industries and styles: online stores, product catalogs, blogs, portfolios, or corporate sites. StoreVilla Pro is an outstanding WordPress eCommerce/WooCommerce theme, packed with powerful features and functionalities. The theme offers lots of customization possibilities, ultimate eCommerce options, Slider Revolution premium plugin support and many more to give you great user experience and usability. It comes with best-ever WooCommerce integration along with its extensions to let you build a complete and perfect online store and also it is well compatible with all other WordPress plugins. EightStore Pro is a feature-rich premium eCommerce WordPress theme with a sleek design, incomparable usability, and powerful support. This theme has deep integration with WooCommerce plugin that supports all possible WooCommerce native settings to enable you to create a perfect online store. It is fully based on cool Customizer tool that allows you to configure almost all elements and live preview the changes instantly. 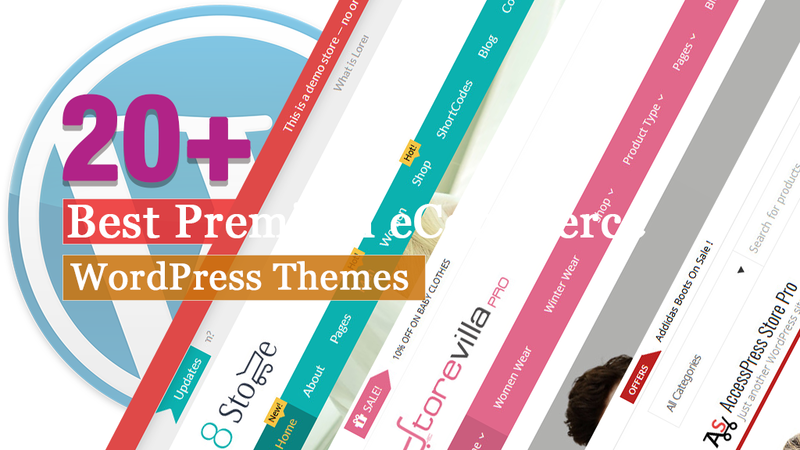 AccessPress Store Pro is an awesome looking premium WooCommerce WordPress Theme that is perfect for creating an eCommerce website or an online store of your own. This theme has the best form of WooCommoerce plugin integration for providing great functionality. It offers simple and easy to use options to design a modern online shop easily. The theme is user-friendly and powerful theme with rich theme features. It is a completely responsive theme. In this article, you can find some of the best eCommerce WordPress Themes comes with beautiful designs that helps to attract the numbers of customers to your site easily. Not only that all these themes are well tested and hamdpicked carefully. And it includes many advaned and powerful features.